Most of you know by now about Kenney's and my obsession with our birthdays (and Halloween)- we want them to be bigger and better than the previous ones! In past years we have done birthday themes such as the classic "A Night at the Oscars" in which, for Kenney's birthday, we draped the exterior of our townhouse in black and red fabric, erected two towering golden Oscars, rolled out a literal red carpet and framed out entertainment center with movie theater drapes. We also decked out our home with a french-themed birthday in which Kenney and friends created a french cafe on our back patio, complete with Eiffel Tower, cafe lights, and french-themed food. Our themed events got to the point where neighbors were offering to help out with out next themed event and wanted to know when that would be. 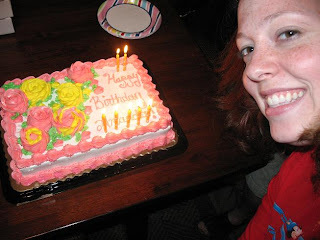 Well, our neighbors may have been disappointed by lack of themeing at home for my 25th birthday, but we weren't!! 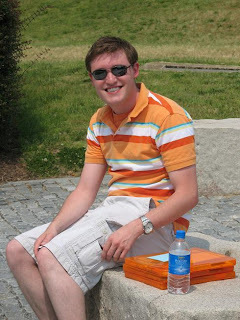 Kenney (with the assistance of one of our friends) planned a scavenger hunt that took us- three teams of three people- to five of the best locations in Richmond. The starting point was at Tredegar Iron Works at 11:30am where we waited for everyone to arrive. This is Moose (Jess, Red Team) and her husband (Dave, Green Team) arriving at the starting line. Each team (Red, Blue and Green) was given a packet of information which included the following: (3) $1 bills, (18) Numbered envelopes with clues, (4) Sheets of blank white paper, (1) Green Crayon, (1) Brown Crayon, (1) Colored pencil. We were instructed that upon the start of the game, we were to open the first envelope and complete the tasks in the order of the numbers on the envelopes. Let the games begin! 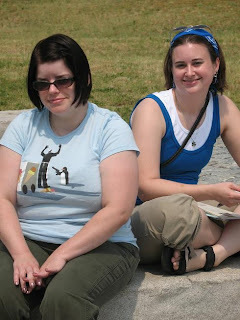 Melissa P. and Jennie D. unite in Blue Team solidarity! 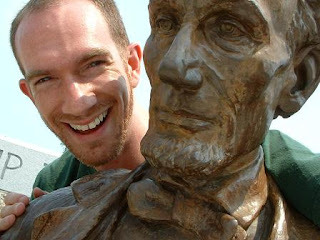 Dave hanging out with Abe Lincoln... one of the scavenger hunt stops for the Green Team. 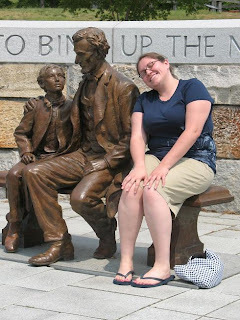 Melissa H., the third in the Blue Team trio, waits patiently with Tad and Abe. 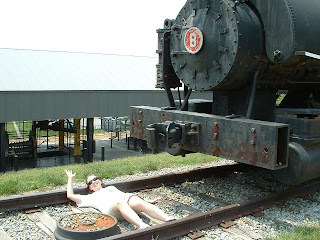 Melissa N. enacts getting run over by a train for the Green Team. 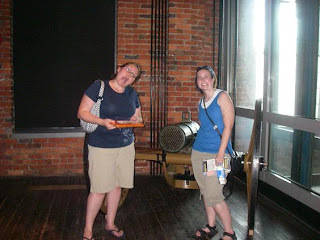 *Authors Note: Melissa N. is the winner of the best theatrical performance during the scavenger hunt. Moose (Jess) getting bowled over by the same train for the Red Team. 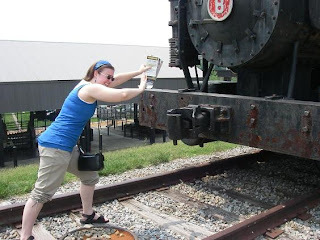 That train is dangerous and Jennie D. is putting a stop to it for the Blue Team! The Blue Team found the V.V. Gun!! 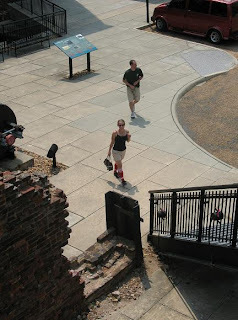 Moose and Scott stretch their legs- completeing the Red Team's clue and getting the cramps out for the next stretch. Melissa N. getting a rubbing of the historical plaque outside the Byrd Theater for the Green Team. 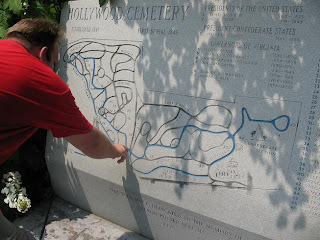 Scott finding #45 (the first burial at this historic cemetary) on the map at Hollywood Cemetary. My favorite task of the scavenger hunt was the clue where we were supposed to take the (3) $1 bills and buy something at World of Mirth for me for my birthday using "no more and no less". Everyone gave a valiant effort trying to get as close to $3 as possible... until my team realized they might let us get a Gift Certificate which they did! Whoot! We all had a blast with the hunt, and Kenney and Michelle let us all know that they wanted one created by one of us so that they can participate in it too. So, Kenney's birthday is coming up in September, and I think I will have to try my hand in creating my own version of the hunt. For those of you who weren't able to participate this time around, keep an eye out for more announcements to come as the time approaches for Kenney's birthday (September 29).